In the past 15 years there has been much information available regarding the use of alternative pollinators to replace honeybees as the primary pollinators of certain crops. Scientists with the Agricultural Research Service (USDA) and others found that blue orchard bees, Osmia lignaria, are particularly good pollinators of early spring orchard crops. These bees are relatively easy to manage and propagate by those who have no prior beekeeping experience. Blue orchard bees are a type of mason bee in the genus Osmia, meaning they are solitary bees that use mud to seal the ends of their nesting tunnels. 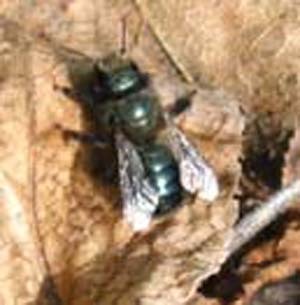 The blue orchard bee, Osmia lignaria, is native to North America where it is found throughout most of the U.S. This bee does not occur in the deep south and is somewhat rare in the great plains. There are many other species of mason bees. They include O. cornifrons, an Asian species used for apple pollination in Japan, O. rufa, or red mason bee, in Europe, and O. ribifloris, a species currently being evaluated as a pollinator of blueberries in the eastern states. 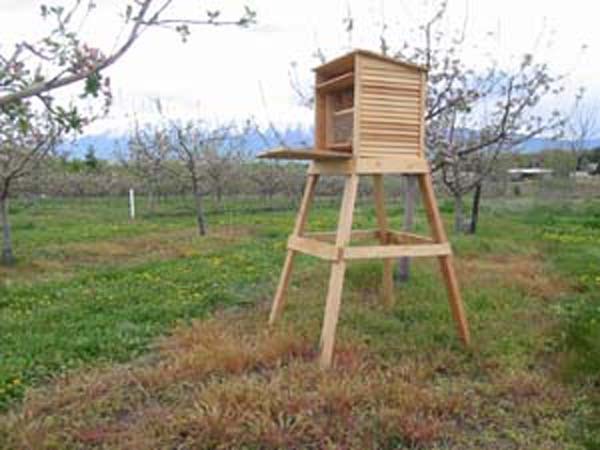 In the U.S. and Canada, the terms “mason bees,” “orchard bees,” and any combinations of the words “mason,” “orchard” and “blue” generally refer to the same species, O. lignaria. The exception is O. cornifrons, an introduced species being used as a pollinator to a lesser extent in California, Oregon and parts of the northeast. Some individuals and companies selling these bees use either of two names: “hornfaced bees,” which is the accepted common name, or just “orchard bees.” The distinction between species is important for management reasons as discussed elsewhere. Osmia bees do not live in complex social colonies. They are gregarious bees that prefer to nest in close proximity to each other. Because there is no shared labor among the bees, all female blue orchard bees construct their nests independently. Unlike honeybees, blue orchard bees do not produce honey, wax or any other products of interest to humans. The pollination service they provide however is highly valuable. Social bees, such as honey bees, will readily sting people or animals that threaten the welfare of the colony. The protection of the queen, young bees and honey reserves are of utmost importance, and worker bees will give their lives to protect the integrity of the hive. In contrast, blue orchard bees have little to defend and will only sting in self defense. 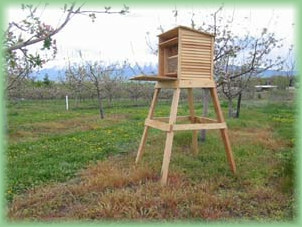 Successful pollination using blue orchard bees does not require a large population of bees. About 250 to 300 female bees per acre are recommended if there are no other bees present. Backyard orchards of a few dozen trees may be adequately pollinated with 50 female bees or less. A high level of pollination efficiency occurs because mason bees land directly upon the reproductive structures of the fruit tree blossom. The abdomens of foraging female bees are loaded with pollen, and the repeated and direct contact with the anthers and stamens results in sufficient pollen transfer. Female bees collect pollen while constructing nests to provide food for bee larvae. Therefore, the key to heavy pollination in the orchard is to promote maximum nesting activity in the orchard bee population.